Predictive Analytics, Big Data, Hadoop, PMML: PMML in Action - 2nd Edition is Out! The data mining community has derived a broad foundation of statistical algorithms and software solutions that has allowed predictive analytics to become a standard approach used in science and industry. For many years, much emphasis has been placed on the development of predictive models. As a consequence, the market place offers a range of powerful tools, many open-source, for effective model building. However, once we turn to the operational deployment and practical application of predictive solutions within an existing IT infrastructure, we face a much more limited choice of options. Often it takes months for models to be integrated and deployed via custom code or proprietary processes. The Predictive Model Markup Language (PMML) standard has reached a significant stage of maturity and has obtained broad industry support, allowing users to develop predictive solutions within one application and use another to execute them. Previously, this was very difficult, but with PMML, the exchange of predictive solutions between compliant applications is now straightforward. The aim of this book is to present PMML from a practical perspective. It contains a variety of code snippets so that concepts are made clear through the use of examples. 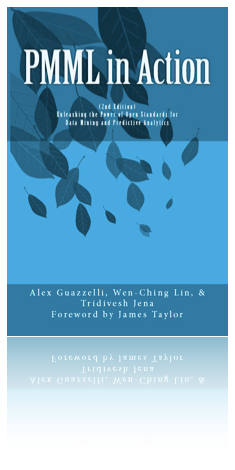 Readers are assumed to have a basic knowledge of predictive analytics and its techniques and so the book is intended for data mining movers and shakers: anyone interested in moving predictive analytic solutions between applications, including students and scientists. PMML in Action continues to be a great way to learn how to represent your predictive solutions through a mature and refined open standard. For the 2nd edition, the book has been completely revised for PMML 4.1, the latest version of PMML. It includes new chapters and an expanded description of how to represent multiple models in PMML, including model ensemble, segmentation, chaining, and composition. The book is divided into six parts, taking you in a PMML journey in which language elements and attributes are used to represent not only modeling techniques but also data pre- and post-processing. With PMML, users benefit from a single and concise standard to represent predictive models, thus avoiding the need for custom code and proprietary solutions.